Recently at Knobcon 2016 I was very lucky to meet an enterprising young man by the name Tenkai. Not only did he save the day (I had a catastrophic computer failure) but he debuted an amazing new eurorack modular sequencer he was working on. 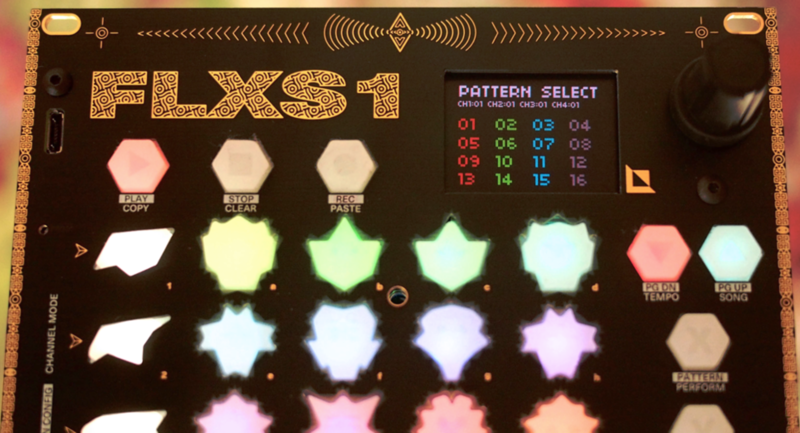 We spoke for hours about the specs, and potential of this amazing sequencer and I have to say I was really impressed!Fast forward 6 months and I have a prototype in my hands for testing and the Kickstarter is NOW LIVE. The hype is real.. this thing is beyond anything I’ve yet to see in the eurorack sequencer world. ratcheting arpeggiations per step, onboard midi, multiple cv and gate inputs, 2 cv per channel as well as gate. color screen and something else, something less tangible … it has character. From the birds that navigate you through the channels to meet the spirits of the steps the colored silicone uniquely shaped buttons are more than just eye catching, they are actually pleasing to the touch. I’ll be showcasing much more of this module as it progresses, but I wanted to take time out and share this kickstarter which is already halfway funded in under 12 hours. This is one to watch! This entry was posted in General, Sequencing and tagged analog, Eurorack, fluxus, flxs1, kickstarter, midi, Modular, ohm, sequencer, sequencing, synth, zeta, zetaohm. Bookmark the permalink.